With the constant rise of energy costs and threat of global crisis, as a home owner or business owner, solar may be a viable option towards alternative energy. Understanding how solar energy works is the first step to going solar in Northern California. After you understand how solar energy works, you will realize just how easy it is to convert to solar. First and foremost, going solar with Wing Solar & Wood Energy, Inc. in Red Bluff, California, means our solar experts will handle everything. All you have to do is make the decision. Are you interested in saving valuable dollars on your utility bills? Do you live off-grid where solar energy may be your perfect option to your energy need? Are you interested in our environment and the effects of your own carbon footprint? If yes or maybe is your answer to any of these questions, our experts at Wing Solar & Wood Energy, Inc. are just a phone call away. How do solar panels or PV panels work? The answer is actually quite simple. Solar panels or PV panels on your home collect energy from the sun. Micro-inverters then take the direct current (or DC) power that is generated by your panels and convert it into alternating current (or AC) power for your home to use. Energy efficient wires and cables that can handle the output from your solar energy system transfer the power to the net meter. The net meter spins both backward and forward, measuring the electricity you are buying as well as the excess electricity your panels are producing and sending back to the grid. That's it. Tap into the endless benefits of solar energy today. Use the electricity your solar panels collected from the sun to power everything in your home. It's Just That Easy! 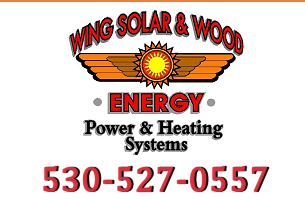 Don't wait, let Wing Solar & Wood Energy, Inc. do the work for you! Installing solar panels on your home or business can have huge benefits on the environment, your property value and for your checkbook. Solar energy might seem like an idea that is difficult to understand. For example, what if there is a cloudy day and there is no sun? What about at night when it is dark? No worries, our experts at Wing Solar & Wood Energy, Inc. will ensure that you are confident in your decision. We will custom design a solar system that meets your needs. Aside from the obvious, saving energy costs and the environment, you are probably asking yourself, "Why solar?" Again, that answer is just as simple as how solar works to begin with. Why are solar panels a great energy choice? There are numerous factors that make solar panels a great choice for homeowners and even small businesses. For example, both the California State and federal government offer incentives and tax rebates for business and homeowners who utilize solar panels and renewable energy. With growing energy costs from traditional methods, using solar power is more attractive than ever. No, solar panels are not cheap, however, with tax rebates and incentives this can offset these costs dramatically. Please tour the guide to financing page of this site for further details. Solar energy can also provide you a much higher asking price if you are considering selling your home. For example, a $500,000 solar property can offer $20,000 or more to the retail value of your home. If you are considering a home improvement project, solar energy is a win, win situation. You can take advantage of lower electricity bills, do your part to save our environment and investment in your future for years to come.